On our recent visit to Providence, Rhode Island to celebrate my sister-in-law Carol’s 80th birthday, we ate at a lovely restaurant by the bay. I had the most delicious salad with only three basic ingredients (plus dressing): arugula, yellow beets, and sliced red onion. I came home and bought the veggie items I needed, all organic, and made it three times since then: twice with arugula, once with spinach, and once by adding avocado to the arugula. Still delicious! Since almost all my ingredients are organic, you could say this is part of Earth Day Every Day, so I am posting it on my Home Page, in Kitchen Nutrition, and on Earth Day Every Day. 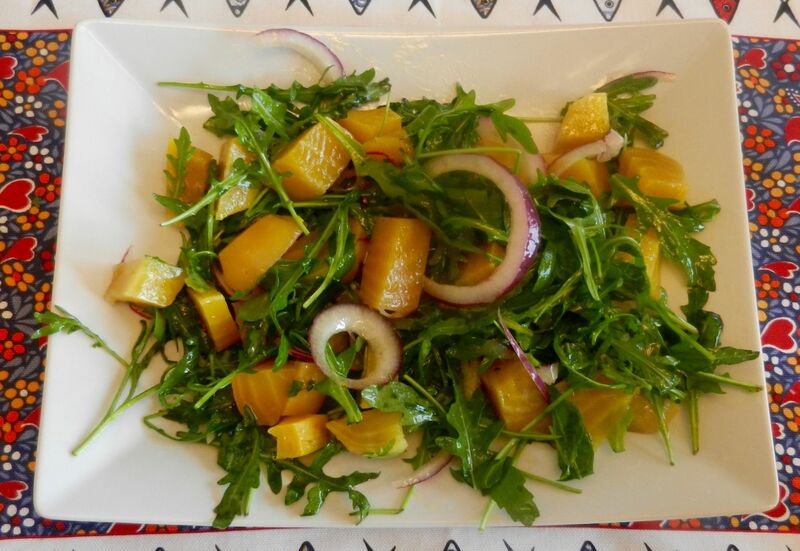 Place washed arugula, sliced red onion, and peeled and cubed beet in a bowl. Toss with dressing and serve.Variations: Substitute organic baby spinach for arugula, use red beet instead of yellow (yellow seems milder), add slices of organic avocado, add walnut pieces or slivered almonds. This entry was posted on Sunday, April 15th, 2018 at 7:48 am	and is filed under Earth Day, Every Day, Home Page, Kitchen Nutrition. You can follow any responses to this entry through the RSS 2.0 feed. You can skip to the end and leave a response. Pinging is currently not allowed.